“He used to cry a lot and couldn’t talk about it so we never knew what happened to his family,” said Ourfali, an Armenian Catholic whose original family name is Khatcherian. Ourfali’s father came to Jerusalem as an orphan just before 1915. He was among those who escaped the massacre at the hands of Turkish nationalists that left 1.5 million Armenians dead between 1915 and 1923. His mother’s family escaped the bloodshed only because her father had served in the Turkish army, making their way to Jordan and then to Jerusalem. Millions of Christians were displaced and about 500,000 Assyrian, Syrian, Chaldean and Greek Christians perished as Turkish nationalists established new borders to the east while ridding the area of Christian non-Turks. Armenia is considered the first country to have accepted Christianity as its state religion in 301 A.D. It has had four independent royal dynasties at different times since the 12th century B.C. In 1991, Armenia gained independence from Russia, which annexed the country into the Soviet Union in 1920. On April 12, Pope Francis will celebrate a Mass commemorating the 100-year anniversary. In February, he declared a 10th-century Armenian monk, St. Gregory of Narek, a doctor of the church. The Vatican also planned to release thousands of documents pertaining to the Armenian genocide from its archives. Turkey denies charges of genocide — defined as a deliberate intent to destroy a nation or people — and maintains that those who died were victims of civil unrest and war in the Ottoman Empire at the time. On the traditional date of commemoration, April 24, Armenian communities in Jerusalem and around the world will hold local memorial ceremonies and Masses. Catholicos Karekin II of Etchmiadzin, patriarch of the Armenian Apostolic Church also is expected to recognize the victims April 23. Although it is called the first genocide of the 20th century, the Armenian Genocide has yet to receive universal recognition. Some governments, such as Belgium, France, Cyprus, Canada and Russia, have adopted resolutions affirming events. Armenians believe that political interests — namely the need for a NATO military base in Turkey — prevent others, including the United States, from recognizing the genocide. Because of the massacre, Armenians dispersed throughout the Middle East, the U.S., Canada, Australia and parts of Europe and many families lost touch, said Msgr. Georges Dankaye, patriarchal administrator of the Armenian Catholic Patriarchal Exarchate of Jerusalem and Amman. Despite the challenges, he said, strong faith allowed Armenians to build anew where they resettled. He acknowledged that events of a century ago are not far from the thoughts of Armenians today. “The victims of the genocide were able to live because of their faith in Jesus. They refused to live as non-Christians. On the contrary, the first things they built in their new homes were schools and (church parishes). My faith helps me overcome the genocide of the past,” said Msgr. Dankaye, whose own family emigrated from Armenia to Syria before the genocide. About 100 Catholic Armenian families and a larger number of Orthodox Armenians live in Jerusalem. Many are in the Armenian Quarter of the Old City. Ourfali and others long to know more about their past. As an Armenian, he said he is especially sensitive to the massacres of innocent people in neighboring Syria and Iraq because of their beliefs and culture. “Why should it still be happening? Things change, but not that much,” he said. Ourfali explained that as refugees, his grandparents and parents struggled to make a new life in Jerusalem, and he is proud that he was able to send his three sons to college. However, two sons decided to take jobs in the U.S., and their Jerusalem residency was taken away by Israel. Now they can only visit on tourist visas, he said. 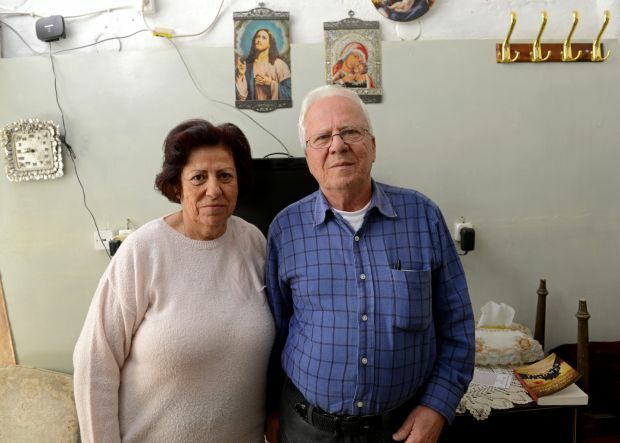 Sitting in his small souvenir shop in the Christian Quarter of the Old City, Michel Behnam, an Assyrian Christian, looked back on his family’s escape from Armenia as they sought refuge in Syria among the Kurds. Behnam’s grandmother committed suicide rather than be taken prisoner by Turkish soldiers, leaving a 6-month-old son — Behnam’s father. It was Beham’s great-grandmother who eventually fled to Syria with the toddler. Armenian artist Vic Lepejian has worked for a year on a 10-foot by five-foot mural made of traditional painted ceramic tile to commemorate the genocide. The work depicts some of the well-known Armenian churches that were destroyed, Armenian heroes, teachers and fighters, streams of refugees leaving their homeland and the heads of beheaded Armenians speared on poles. His father escaped the massacre with his family as a toddler, surviving at times on grasses and wild plants, Lepejian said. His mother’s wealthier family managed to escape with gold coins sewn into the children’s blankets. “They burned us in churches and still we prayed,” said Lepejian. Msgr. Dankaye said that had the world taken note of the massacre a century ago the Holocaust might not have happened. The genocide, he said, remains an open wound. What Armenians are seeking, the priest said, is recognition of the crime committed against them.